Heartburn is one of the most common symptoms experienced during pregnancy. According to various estimations, from 60% to 90% of all pregnant women suffer from heartburn symptoms at some stage of their pregnancy. Heartburn and its underlying related conditions can manifest in numerous ways, including indigestion, a painful burning sensation behind the breastbone and a sour taste in the back of the throat during or after a meal. Factors that contribute to acid reflux formation. Heartburn occurs when various gastric juices (bile, digestive enzymes and acids), leak up from the stomach onto the lining of the esophagus. In a healthy organism, the valve at the lower end of the esophagus (called LES - lower esophageal sphincter) usually keeps the stomach contents inside the stomach. When the LES's muscle does not work right, stomach acids and other corrosive liquids flow backward into the esophagus. While occasional heartburn is common and should not cause special concerns, persistent heartburn can be a typical symptom of a chronic disease called acid reflux, or GERD (gastro-esophageal reflux disease). Certain dietary choices such as the excessive consumption of acid forming foods (i. e. wine, eggs, liver etc. ), Candida aggravating foods, allergy causing foods and hard to digest foods, such as meat and diary products. Stress and inadequate sleep that suppress the immune system. When the immune system is weakened it can lead to a variety of health complications, including Candida overgrowth, sluggish digestive system and toxic overload. All of these can directly or indirectly aggravate acid reflux. Obesity increases the pressure on the abdomen thus allowing more stomach contents to leak into the esophagus. Pregnancy may also be one of GERD's contributing factors. The link between pregnancy and heartburn can be explained by the fact that pregnancy hormones have a relaxing effect on all smooth muscle tissues, including the LES. Moreover, the enlarging uterus may also exacerbate the problem by increasing the pressure on the abdominal area thus causing more acids to splash back into the esophagus. Finally, during pregnancy, many women suffer from various gastrointestinal problems , such as indigestion, constipation and bloating. Sluggish digestive process can indirectly aggravate your existing acid reflux condition. The treatment of GERD using medicaments can be very challenging especially during the pregnancy, since most drugs are not recommended to pregnant women. Even the drugs that are officially allowed to pregnant women are not recommended because of the unavoidable side effects. Did you know that pregnant woman could achieve immediate relief from their heartburn and completely cure their underlying acid reflux condition by choosing the holistic approach that tackles the internal environment that contributes to GERD symptoms in the first place? 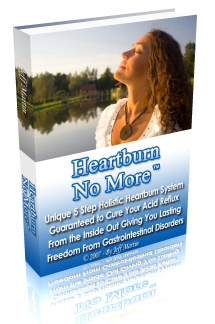 By choosing the natural approach you can eliminate and prevent heartburn safely and effectively.